On May 13, 1917, ten-year old Lucia Santos and her cousins Jacinta and Francisco Marto were herding sheep at a location known as the Cova da Iria near their home village of Fatima, Portugal. Lucia described seeing a woman “Brighter than the sun, shedding rays of light clearer and stronger than a crystal ball willed with the most sparkling water and pierced by the burning rays of the sun”. She appeared again on the 13th day of the months of June and July. In these, the woman asked the children to do penance and “Acts of Reparation” as well as making personal sacrifices to save sinners. The three children started penance, wearing tight cords around their waists to cause themselves pain, performed self-flagellation using stinging nettles, abstained from drinking water on hot days, and performed other works of penance. 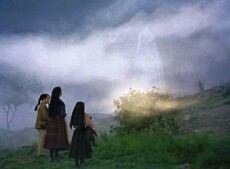 The woman in the course of her appearances confided to the children three secrets, now known as the “Three Secrets of Fatima”. Thousands of people flocked to Fatima in the following months, hearing reports of visions and miracles. On August 19, 1917, the Provincial Administrator believing the events were politically motivated jailed the children before they could reach the Cova da Iria that day. The Prisoners testified that the children were upset, but were consoled by the prisoners and later led the prisoners in praying the Rosary. The Administrator interrogated the children and tried unsuccessfully to get them to tell the contents of the secrets. In the process, he threatened the children, saying he would boil them in a pot of oil, one by one unless they confessed. The children refused, but Lucia told him everything short of the Three Secrets, and offered to ask our Lady for permission to tell the Administrator the Secrets. That month, the children were not able to see the Blessed Virgin Mary on the 13th, but reported they saw her on August 15th, the Feast of the Assumption, at nearby Valinhos. The Virgin Mary promised a miracle for the last of her apparitions on October 13, so that all would believe. What happened became known as the “Miracle of the Sun”. A crowd believed to number approximately 70,000, including newspaper reporters and photographers gathered at the Cova da Iria. The heavy rain had finally ceased and a thin layer of clouds cloaked the silver disc of the sun. Witnesses said later it could be looked upon without hurting the eyes. Lucia, moved by an interior impulse, called out to the crowd to look at the sun. Witnesses spoke of the sun appearing to change colors and rotate like a wheel. Not everyone saw the same things, and many said the sun “danced”. The phenomenon is claimed to have been witnessed by most people in the crowd as well as people miles away. While the crowd was staring at the sun, Lucia, Francisco and Jacinta said later they were seeing lovely images of the Holy Family, Our Lady of Sorrows with Jesus Christ, and then Our Lady of Mount Carmel. They said they saw St. Joseph and Jesus bless the people. The Children were 10, 9, and 7. Some onlookers reported other phenomena, including luminous mist and the showers of flower petals seen around and above the trees. In addition to the Miracle of the Sun, the seers indicated that the apparition prophesied a great sign in the night sky, which would precede a second great war. On January 25, 1938, bright lights, an Aurora Borealis appeared all over the northern hemisphere, including places as far south as North Africa, Bermuda and California. People in Paris thought a great fire was burning and fire departments were called out. Lucia said it was the foretold sign and so apprised her superior and Bishop in letters the following day. Just over a month later, Hitler seized Austria and eight months later invaded Czechoslovakia. The First Secret was a vision of hell, which Lucia describes, “Our Lady showed us a great sea of fire which seemed to be under the earth. Plunged in this fire were demons and souls in human form, like transparent burning embers, all blackened or burnished bronze, floating about in the conflagration, now raised into the air by the flames that issued from within themselves together with great clouds of smoke, now falling back on every side like sparks in a huge fire, without weight or equilibrium, and amid shrieks and groans of pain and despair, which horrified us and made us tremble with fear. The demons could be distinguished by their terrifying and repulsive likeness to frightful and unknown animals, all black and transparent. This vision lasted but an instant. How can we ever be grateful enough to our kind heavenly Mother, who had already prepared us by promising, in the first Apparition, to take us to Heaven. Otherwise, I think we would have died of fear and terror”. The Second Secret included Mary’s instructions on how to save souls from hell and convert the world to the Christian faith, also revealed by Lucis, “I have seen hell where the souls of poor sinners go. To save them, God wishes to establish in the world devotion to my Immaculate Heart. If what I say to you is done, many souls will be saved and there will be peace. The war is going to end: but if people do not cease offending God, a worse one will break out during the Pontificate of Pope Pius XI. When you see a night illuminated by an unknown light, know that this is the great sign given you by God that He is about to punish the world for its crimes, by means of war, famine, and persecutions of the Church and of the Holy Father. To prevent this, I shall come to ask for the Consecration of Russia to my Immaculate Heart, and the Communion of reparation on the First Saturdays. If my requests are heeded, Russia will be converted and there will be peace; if not, she will spread her errors throughout the world, causing wars and persecutions of the Church. The good will be martyred; the Holy Father will have much to suffer; various nations will be annihilated. In the end, my Immaculate Heart will triumph. The Holy Father will consecrate Russia to me, and she will be converted, and a period of peace will be granted to the world”. Lucia became a Nun, and reported seeing the Virgin Mary again in 1925 at the Dorothean Convent at Pontevedra, Galicia (Spain). This time she said she was asked to convey the message of the First Saturday Devotions. Sister Lucia was transferred to another convent in Tui, Galicia in 1928. In 1929, Sister Lucia reported that Mary returned and repeated her request for the Consecration of Russia to her Immaculate Heart. Sr. Lucia saw Mary in private visions periodically throughout her life. In 1931, Jesus visited her, taught her two prayers and delivered a message to give to the Church’s hierarchy. In 1947, Sr. Lucia left the Dorothean Order, and joined the Discalced Carmelite Order in a Monastery in Coimbra, Portugal. She died on February 13, 2005 at the age of 97. After her death, the Congregation for the Doctrine of the Faith, specifically Cardinal Joseph Ratzinger, ordered her cell to be sealed off. This was done because of the ongoing revelations that she received, and they would be needed for the examination of her canonization. Sr. Lucia’s cousins, Francisco and Jacinta were both victims of the Great Spanish Flue epidemic of 1918-1920. Pope John Paul II declared them both venerable in a public ceremony at Fatima on May 13, 1989. He returned on May 13, 2000 to declare them blessed. Jacinta is the youngest martyred child ever to be beatified, at the age of 9. In both years, 1936 and again in 1941, Sr. Lucia said the Virgin Mary had prophesied the deaths of these two. Jacinta had told her mother that she was to be taken soon, after the initial apparition. On June 13, 1941, Lucia asked the Virgin Mary if the three children would go to heaven when they died. She said that Mary replied, “Yes, I shall take Francisco and Jacinta soon, but you will remain a little longer, since Jesus wishes you to make me known and loved on Earth. He wishes also for you to establish devotion in the world to my Immaculate Heart”. Sr. Lucia said the Virgin Mary promised that the Consecration of Russia would lead to Russia’s conversion and an era of peace. Pope Pius XII, in his Apostolic Letter “Sacro Vergente” consecrated Russia to the Blessed Virgin Mary. Pius XII wrote, “Just as a few years ago We consecrated the entire human race to the Immaculate Heart of the Virgin Mary, Mother of God, so today We consecrate and in a most special manner We entrust all the peoples of Russia to this Immaculate Heart”. In 1952 the Pope said to the Russian people and the Stalinist regime that the “Virgin Mary was always victorious. The gates of hell will never prevail, where she offers her protection. She is the good mother, the mother of all, and it has never been heard, that those who seek her protection, will not receive it. With this certainty, the Pope dedicates all people of Russia to the Immaculate Heart of the Virgin. She will help! Error and atheism will be overcome with her assistance and divine grace”. Popes Pius XII and John Paul II both had special relations to Our Lady of Fatima. Pope Benedict XV began Pacelli’s church career, elevating him to Archbishop in the Sistine Chapel on May 13, 1917, the date of the first reported apparition. Pope John Paul II again, consecrated the entire world to the Virgin Mary in 1984, without explicitly mentioning Russia. Some believed that Sr. Lucia verified that this ceremony fulfilled the requests of the Virgin Mary. However, in the Blue Army’s Spanish magazine, Sol de Fatima, in the September 1985 issue, Sr. Lucia said that the ceremony did not fulfill the Virgin Mary’s request, as there was no specific mention of Russia, and “Many Bishops attached no importance to it”. In 2001, Archbishop Tarcisio Bertone issued a statement, claiming that he had met with Sr. Lucia, who told him, “I have already said that the Consecration desired by Our Lady was made in 1984, and has been accepted in Heaven”. At the time that she had died, she had not made a public statement of her own to settle the issue. Some maintain that Russia has never been specifically consecrated to the Immaculate Heart of Mary by any Pope simultaneously with all the world’s Bishops, which is what Lucia in the 1985 interview had said Mary had asked for. However, by letters of August 29, 1989 and July 3, 1990, she stated that the Consecration had been completed, indeed in the 1990 letter in response to a question by Rev. Father Robert J. Fox, she confirmed, “If the consecration made by Pope John Paul II on March 25, 1984 in union with all the Bishops of the world, accomplished the conditions for the Consecration of Russia according to the request of Our Lady in Tuy, on June 13, 1929. Yes, it was accomplished, and since then I have said that it was made. And I say that no other person responds for me, it is I who receive and open all letters and respond to them”. The Third Secret, a vision of the death of the Pope and other religious figures was transcribed by the Bishop of Leiria and reads, “After the two parts which I have already explained, at the left of Our Lady and a little above, we saw an Angel with a flaming sword in his left hand; flashing, it gave out flames that looked as though they would set the world on fire; but they died out in contact with the splendor that Our Lady radiated towards him from her right hand; pointing to the earth with his right had, the Angel cried out in a loud voice; Penance, Penance, Penance! And we saw in an immense light that is God; something similar to how people appear in a mirror when they pass in front of it’ a Bishop dressed in White we had the impression that it was the Holy Father. Other Bishops, Priests, Religious men and women going up a steep mountain, at the top of which there was a big Cross of rough-hewn trunks as a cork-tree with the bark; before reaching the Holy Father passed through a big city half in ruins and have trembling with halting step, afflicted with pain and sorrow, he prayed for the souls of the corpses he met on his way; having reached the top of the mountain, on his knees at the foot of the big Cross he was killed by a group of soldiers who fired bullets and arrows at him, and in the same way there died one after another the other Bishops, Priests, Religious men and women, and various lay people of different ranks and positions. Beneath the two arms of the Cross there were two Angles each with a crystal aspersorium in his hand, in which they gathered up the blood of the Martyrs and with it sprinkled the souls that were making their way to God”.